It is not uncommon for me to wake up during the night to go pee but tonight I am woken by discomfort. The situation reminds me of a fairy tale about a princess on a pea that my mom used to tell me; however my pea is a size of a rock and just as hard. My pad is almost deflated and with no insulation between me and a hard ground there is nothing to stop the cold from penetrating into my sleeping bag. Dave is also stirring. His pad is leaking at a higher rate than mine and so far he didn’t get much sleep at all. Most of his spare closing is now stuffed underneath his pad creating a meager layer of insulation. 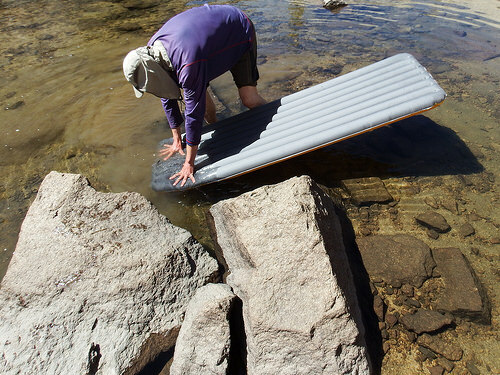 The malfunction of our sleeping pads is puzzling. We were nothing but careful with them. The only time we ever handled them outside of tent was when they were drying last afternoon. We placed them empty of all air on a smooth granite slab for about 10 minutes. How could they both get punctured? The morning makes it clear that Upper Rae Lake will not be our testing ground. The surface is rippled by a breeze and the sun has not reached the basin yet, fact that makes the idea of stepping into the cold water quite unattractive. And so we set out towards the second to last pass on the trail. Glen Pass tops at 11,978 feet. 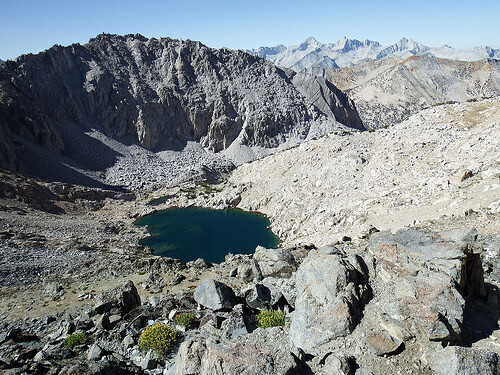 The views are inciting and include all the classic peaks in the area as well as part of Rae Lakes basin. To the south there is a sheer wall with a lake at the base. We are about three quarters up when I hear my name called through the wind. I turn to the source of the exclamation and find Sarah just few switchbacks below us. Reunited at the top of the pass Sarah explains that they stopped about half mile short of the meeting spot. John was not up for continuing further. Having my own low yesterday I could relate. Michelle tops next and shortly after her Kevin and Julie. All of us enjoy the impromptu get-together. Before we leave we wish each other good luck. 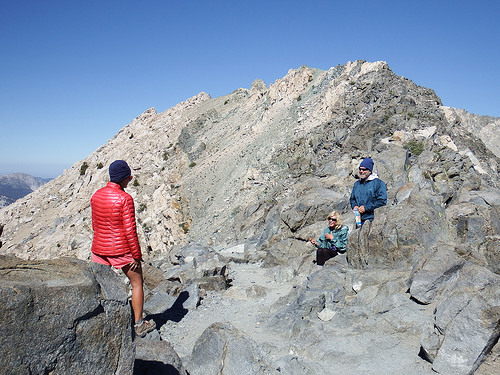 While Sarah, Michelle and now also John still hike on a similar itinerary to ours and it’s likely we will share the rest of the journey together, Kevin and Julie are resupplying and will be a day or two behind us. Our next stop is at a tarn about a mile from the pass. The air is calm and the sun is out. It’s time to get to work. The still surface of the tarn betrays the leaks as soon as we dunk our pads. The tiny holes get fixed with tenacious tape and we are back moving. The valley we are heading for is not as hot as some of the others we crossed. Vegetation is back, sparse at first but dropping below 10,000 feet brings back many plants including the ever welcome currants. The trail doesn’t have us low for long. 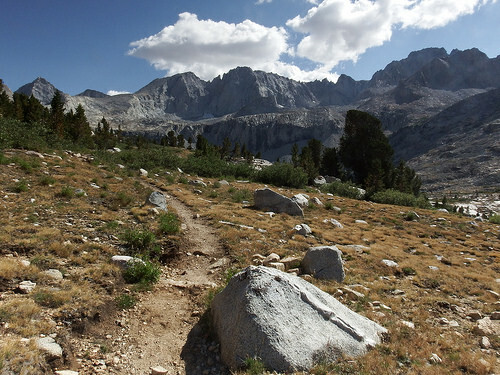 It bounces at 9,500 feet and from there we are on our way to Forester Pass, the very last pass on JMT. We don’t plan to climb it today, one pass a day is plenty, but we would like to get as close as possible so that we can scale it first thing tomorrow morning. According to our spreadsheet, there are several camping possibilities along the incline, but not all of them might have running water available at this time of the year. Sarah and Michelle have the same idea and for a while we leap frog with them. Luck is on our side when we arrive at a meadow at mile 184. 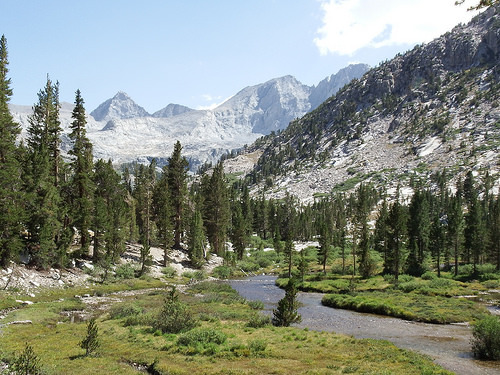 There are couple of sites at the edge of the meadow with a beautiful view; and those are taken; however the cluster of about 5 sites under a cover of Whitebark pines is wide open. We make ourselves at home and after completing few camp chores we have the rest of the evening to both enjoy and brace ourselves for tomorrow’s big climb.